On March 25th, CMS hosted a 7th and 8th grade science night, which showcased 8th grade science projects and our 7th grade Prezis. The event was great success! Thank you to all of the parents that joined us in supporting the hard work that our students put into their projects. For the first time, four CMS students qualified for the Regional History Bee. There were forty-eight students from four states. Each student participated in three rounds. Congratulations to Sam, Jake, Claire, and Nick. From Left: Nick W., Claire m., Jake L., and Sam R.
The team competed in Chadron on March 19 and in Banner County March 21. 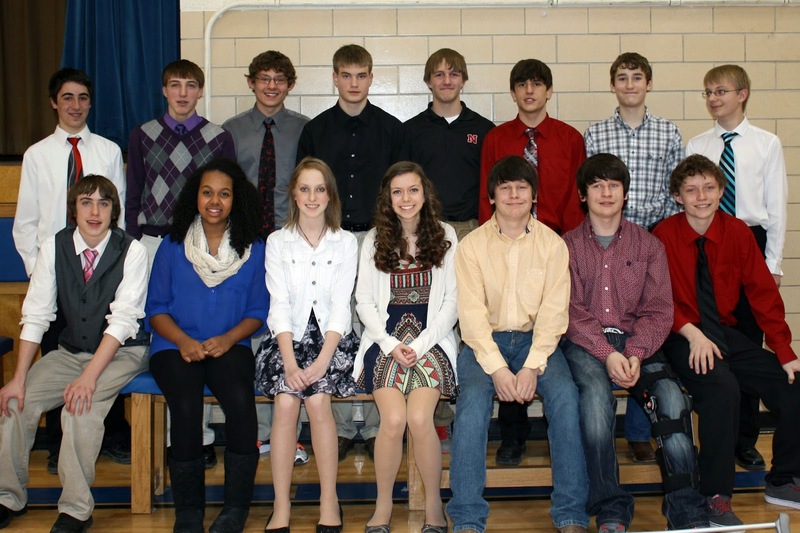 Members of the 8th Grade Scholastic Team are: Back row, left to right: Zach Carratini, Coy Bila, Joe Matt, Nick Wordekemper, Sam Rischling, Jeff Cerny, Cody Madsen, Hunter Hawk, Front row: JashwaAlan Cummings, Mumbi Mwara, Aubree Noble, Brooklyn Stack, Drew Jersild, Beau Jersild, Brayden Richardson. The team placed 2nd in Chadron on March 19th, losing the championship round to Sidney 100 to 105. They then took 1st place in Banner County on March 21st where Chadron earned 420 points, Sidney earned 400 points and Creek Valley earned 390 points. 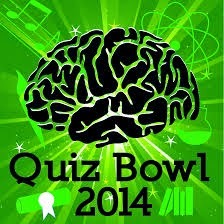 Both teams will compete in the final quiz bowl competition of the season on April 4th at Gering. On March 19th, Chadron Middle School hosted it's 3rd annual Quiz Bowl competition. Schools that were in attendance included: Chadron, Sidney, Bridgeport, Hay Springs, Morrill, Gordon/Rushville, Gering, and Mitchell. Participating students engaged in three rounds of academic competition that tested their knowledge in math, history, geography, current events, science, fine arts, English, and sports. The majority of competition was held in classrooms at Chadron Middle School, where CMS teachers served as question facilitators, score keepers, and judges. The championship rounds were held at the Chadron High School auditorium, where students were on "The Big Stage" to compete for the title. The 7th grade championship round saw Gering vs. Sidney. Sidney won the round, but Gering fought hard to make it interesting. The 8th grade championship round pitted Chadron vs. Sidney. Again, Sidney took home the gold, but Chadron staged a tremendous comeback, but came up short by just five points, which equates to one question. Chadron Middle School would like to thank all of the students and coaches that attended our quiz bowl. The students were great and we hope that everyone had a lot of fun. It's testing season and at the middle school level that means standardized assessments in Reading, Math, English, and Science. 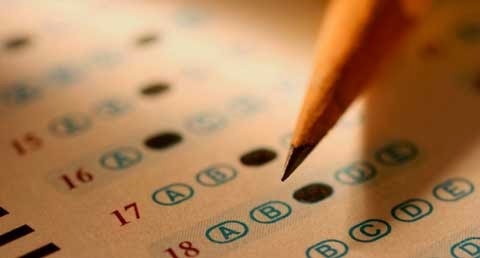 Over the next 7-weeks, students at CMS will take the Measures of Academic Progress (MAPs) tests in Reading, Math, Language Usage, and Science as well as NeSA tests in Reading, Math, and Science. Please take a moment to review the testing schedule and note which days your student(s) will be testing. Testing can be a stressful time for students. Parents can do a lot to help relieve some of this stress by talking to their student(s) about testing and encouraging them to take their time and do their best. You can also help prepare them by ensuring that they get enough rest on the night before the test and that they eat a healthy breakfast on the morning of the test. If you any questions about the schedule, please contact Mr. Dressel at 432-0708 or by email at nichlas.dressel@chadronschools.net. The Washington D.C. group is having a contest to design the t-shirt the group will get for the trip. 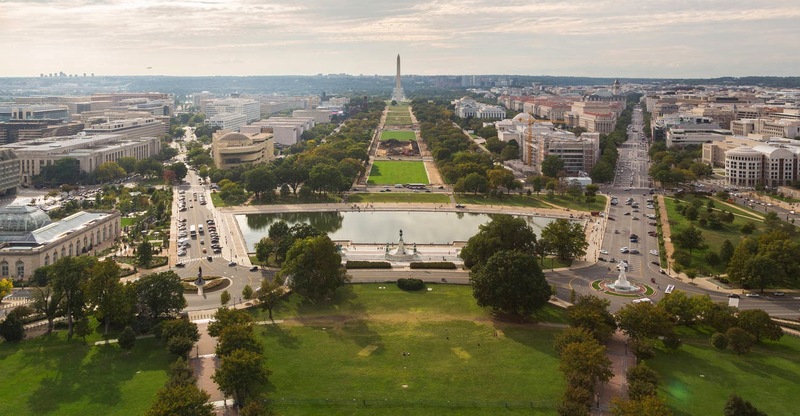 If you are interested in designing a t-shirt for the Washington D.C. group, please turn in a design to the CMS office by April 21st. The group will then vote on their favorite design and have t-shirts made! Students, staff, parents and friends are invited to join the fun as we begin the 4th Annual Morning Marathon Club! We will meet before school, Mondays through Fridays on the high school track to walk/jog/run supervised ¼ mile laps. Our first day will be March 17, 2014. We will NOT meet March 19, April 18 & 21, due to no school on those days. Mark your calendars for our finale with the Panhandle Run for Youth on May 17, 2014! Miles will be collected individually for every participant. The first day each student participates, s/he will receive a MMC wristband. After 10 days of participation, each student will receive a roll up water bottle! 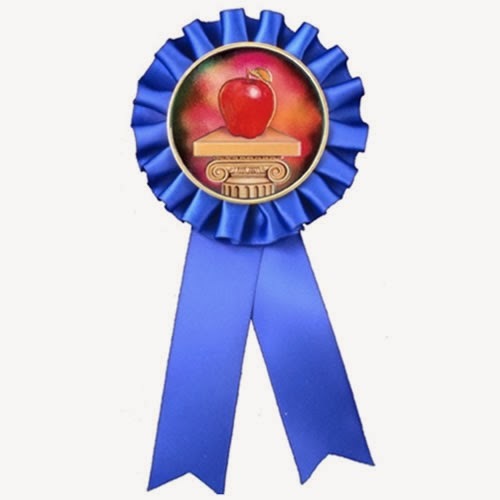 Each student reaching the 26.2 mile Marathon level (105 laps) will receive an additional award! Also, thanks to the support of our Chadron Public Schools Foundation, each participating student will get FREE entry into the 5k/Fun Run on May 17, 2014! The main goal of this program is to give each participant a positive start to the day and establish a routine of exercise and a healthy breakfast. This will help them build confidence and self esteem that comes from setting goals and crossing the finish line. Lace up those running shoes and let’s get moving! Each student who participates must have a signed permission form. Form must be turned in to Mrs. Rischling before participating – just bring it to track! Students in first grade and older may run unaccompanied. Kindergarten students need a parent with them for the first week. Students must check in at the base of the “home bleachers” on the High School Track before they can count laps! Primary and Middle School students may begin any time between 7:15 and 7:40. No runners may begin after 7:45. CIS students may participate between 7:00-7:30. Parents and Staff are welcome (and encouraged!) to join in! Students will be given a card at the completion of each lap, then turn in their cards when they are done each day. This will allow tracking of laps/miles. Comfortable school clothes and sport shoes are appropriate for running. Students may bring a snack for “refueling.” Water and a breakfast type bar are appropriate. Please be sure to finish the snack before school starts and dispose of trash properly. Creative Dining will offer a grab and go breakfast. Due to meal requirements, students will be required to take a full breakfast. It will include a fruit, a grain &/or meat alternative (yogurt/string cheese) and a milk. The breakfast will be charged to the students meal account and the cost will be determined by your qualification of free, reduced price $.30 or full pay $1.55. Any questions, contact Sonja Bruhn at 432-0724. General guidelines for cancellation will be wind chill below 25 degrees, rain, snow, or wind gusts over 35 mph. This program relies on a large number of parent volunteers. The track will be supervised daily by Parent Volunteers. We need you! It’s a great way to start the day with your kids! If you have questions or would like to volunteer please contact Linda Rischling @ 430-4122. The 3rd quarter ended on March 12th and CMS students that had perfect attendance and displayed outstanding effort were recognized at the end of the quarter assembly. Congratulations to these students and to all of the students that worked hard during the 3rd quarter. The 4th quarter begins on Monday, March 17th. We encourage all of our students to take advantage of the fresh start that comes with the new quarter and work hard to end the school year strong! Jameson M., Michael M., Daniel W.
From Left: Eli A., Dillan B., Curtiss B., Abigail G., Cole M.
From Left: Trev C., Claire M.
From Left: Jared F., Hunter H., P.J. S., Mark T., Megan T.
Samantha J. and Jiesinh S.
Daniela S. and Seth O.
Abby H. and Claire M.
Nick Dressel, Terri Haynes, Donna Brice and Tori Wild. The Chadron Ladies Golf Association's Putt-A-Round Committee donated $1200 to the Chadron Middle School Playground Project. The $1200 came from the proceeds of the recent Putt-A-Round event that took place at local business at the end of February. Chadron Middle School would like to thank the committee for their generous donation in support of the project. 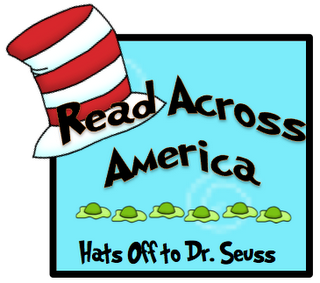 Read Across America is an annual reading motivation and awareness program that calls for every child in every community to celebrate reading on March 2, the birthday of beloved children's author Dr. Seuss. Over the past three years, 8th graders at Chadron Middle School have celebrated Read Across America Day by going to Chadron Primary School, Chadron Intermediate School, and the Child Development Center to read books to the children. This year, Read Across America Day fell on a Sunday, so CMS 8th graders read to students at CIS on Friday and to students at CPS and the CDC on Monday. Chadron Middle School would like to thank CIS, CPS, and the CDC for allowing our 8th graders to share their love of reading with their students! On February 28th, over 80 students students from across the Panhandle submitted National History Day projects for judging at the regional NHD competition that was held at Chadron State College. 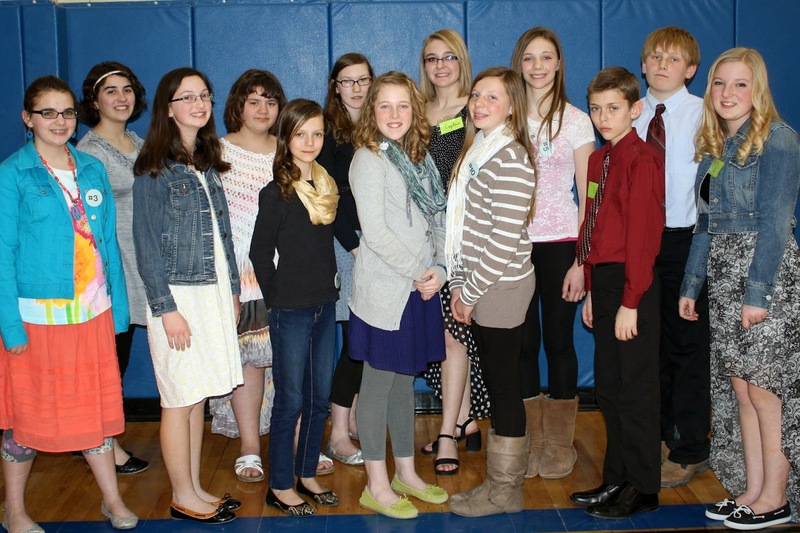 Chadron Middle School had twenty-six students submit fifteen projects in the competition. Congratulations to the following students for qualifying for State NHD, which will be held on April 12th: Joe M., JashwaAlan C., Zayne J. (Treaty of Versailles), Claire M., Abby H. (Ida B. Wells), Alpine H. (A.I.M. ), Sam R. (New York Draft Riots), Kat D. (Newsboy Strike of 1899), Evelyn M. (Documentary - The Irish Potato Famine), Kellie W. & Anabel G. (Website - Mary Surratt), Hunter H. & Brooklyn Stack ((Brown v. Board of Education). Below are just a few examples of the excellent work that these student produced.